The Sacred Heart Area School Catholic Schools Week Kickoff Masses will be held at Sacred Heart Church January 26th at 5pm and at St. Michael’s January 27th at 10:30am. The Dancing Gauchos are to perform at Sacred Heart Area School February 1st. They are dancers/entertainers from Argentina. The show will be entertaining as well as educational. Students from Christ the King of Browerville and St. Henry’s of Perham will attend as well. All are welcome! The Sacred Heart Area School “Wild for God” Carnival and Dinner will be held February 3rd at the school and church. The raffle drawing will be held in the school gym at 3pm. By your tickets today! 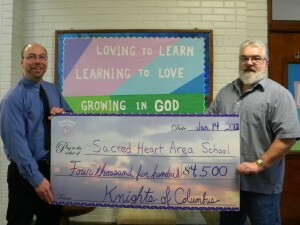 Sacred Heart Area School thanks the Knights of Columbus for all of the work they did on the calendar raffle. The Knights presented our school with a check of $4,500.00, which came from the profits from their calendar sales and what the students sold. Thank you all for all your hard work! pictured to leftt: Jim Opelia, Principal and Dennis Hansen, Knight Calendar Coordinator. Wednesday night’s, January 16th, movie night was enjoyed by 55 members of our school family. We watched “Ice Age 4”, with popcorn and drink. Thank you Home and School officers for hosting this event and for continuously striving to strengthen our sense of family at SHAS!